Congresswoman Robin Kelly (IL-02) and Congressman Dan Kildee (MI-05) hosted a forum yesterday in East Hazel Crest, Ill., focused on how communities across the country are facing significant fiscal stress due to extreme austerity measures that have reduced essential public services such as emergency medical services, police, fire services and trash collection. The forum is part of Congressman Kildee’s ongoing “The Future of America’s Cities and Towns” initiative to better align local, state and federal policies with the unique challenges facing older, industrial communities. Kildee serves as the co-chair of the Congressional Urban Caucus and Vice Ranking Member of the House Financial Services Committee. 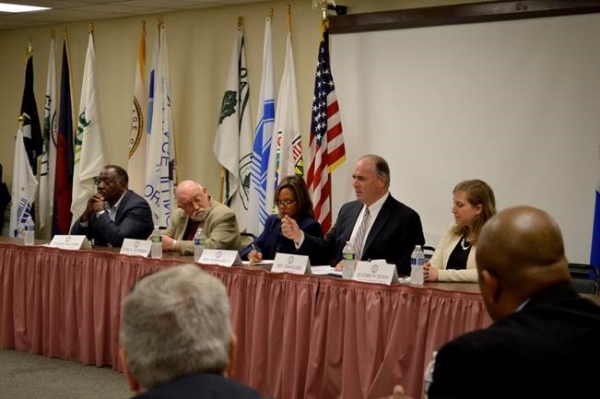 Other panelists at today’s forum included John A. Ostenburg, the Mayor of Park Forest, Ill., Eugene Williams, the Mayor of Lynwood, Ill., and Elizabeth Schuh, a policy analyst at the Chicago Metropolitan agency for planning. Seven other mayors and multiple city managers from the area also attended and shared their perspective on how Congress can help their cities and towns find ways to be successful. The Future of America’s Cities and Towns is an initiative launched by Congressman Kildee to highlight the many challenges that cities and towns across the U.S. face regarding infrastructure needs, economic development, housing, blight and jobs in the modern economy. The initiative calls for a national strategy on how Congress invests in American cities and towns. The first roundtable included Ranking Member of the House Financial Services Committee, Maxine Waters (CA-43), and focused on the unique challenges facing many older, industrial cities and towns. The second roundtable focused on economic and community development financing and included Vice Ranking Member of the House Ways and Means Committee Brian Higgins (NY-26). The third roundtable included Congresswoman Elizabeth Esty, Vice Ranking Member of the Transportation and Infrastructure Committee, and focused on how Congress must make critical investments to improve America’s water infrastructure system, including replacing lead pipes to protect public health. Congressman Kildee also previously spoke at the TrustBelt conference in Des Moines, Iowa, and events hosted by the Urban Institute and the National Leagues of Cities in Washington, D.C., all on the need to focus on investing in older, industrial cities and towns.